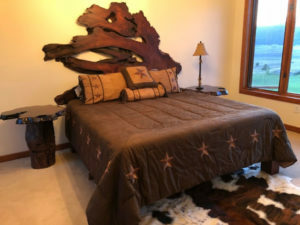 Burl Wood Headboards & Wall Art Archives | Redwood Burl Inc.
Kelly Maxwell of Littlebranch Farm used one of our raw wood natural edge headboards, coupled with cozy Western bedroom decor. Many people use burl wood headboards and wall art as an incredible and unique way to decorate their bedrooms. These raw edge wooden headboards are all the talk in Western furniture and bedroom decor. Unique, rustic, and breathtaking, burl wood headboards add a distinctive touch of warmth to the bedroom. They are one of those unique items that dreams are made of. You just find the perfect slab and we will do the rest! We offer professional wood finishing services on our products, but can also deliver them raw and unfinished. Once you choose the perfece piece from our burl wood headboards and wall art options, you are on your way to creating natural woodsy comfort and charm in your home for years to come. Adorn your bedside with a live edge natural redwood headboard! Add additional details of cozy charm with natural edge bed side tables. Most people use these uniquely shaped pieces as burl wood headboards and wall art pieces. You simply cannot find this type of rustic and natural appeal elsewhere! With redwood, all aspects of high quality wood work in your favor. The dark redwood colors, along with the raw edge shape and outline each piece is so unique. With one of these beauties above your bed, you will sleep in a bedroom of woodsy charm and coziness. Of course, you can get creative and use our raw redwood slabs for other D.I.Y. wood working projects. Lastly, if you don’t see what you need here and we will source something for you from our vast inventory. Once you select your piece, we can either ship it is raw wood supply or we can prepare and finish it for you. We can arrange to just have it sanded, or we can ship it to you completely ready to install. But finishing it is half the fun, so if you are into custom wood working, or are up for a DIY wooden headboard project, we will leave that to you! HB-101 - 77" x 28" x 3"
- 103" x 30" x 3"
- 97" x 22-53" x 3"
- 56" x 46" x 3"
- 68" x 32" x 3"
- 72" x 44" x 3"
- 64" x 36-24" x 3"
- 65" x 26" x 2.5"
- 78" x 37-24" x 3"
- 96" x 34-42" x 3"
- 56" x 25" x 2.5"
- 70" x 37" x 3"
- 68" x 44" x 3"
- 80" x 36" x 3"
- 67" x 70" x 3"
- 70" x 43" x 3"
- 50" x 36" x 3"
- 80" x 65" x 3"
- 60" x 70" x 3"
- 78" x 35" x 3"